If there was one particular droid in the entire Star Wars universe that has certainly made its mark more than just a fleeting appearance, saving the Rebel Alliance over and over again and being instrumental in the lives of major characters, then R2-D2 would be it. R2-D2 can be more or less considered as the little droid that could, having managed to ride on a wave of serendipity before finally ending up helping Luke Skywalker pilot his X-Wing, just like how he did for Luke’s father in space dogfights many, many years earlier. Having an array of hidden gadgets and capabilities, at least in the movies, R2-D2 has exhibited unprecedented levels of ingenuity when it comes to getting out of a particularly tight or difficult situation, even against other droids that are way larger and more powerful than it. You can add another detail to his list of achievements, which is, to function as a can cooler, now how about that? 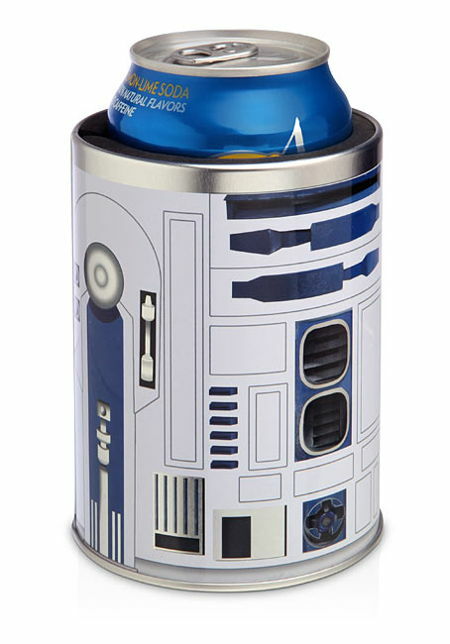 The $7.99 Star Wars R2-D2 Can Cooler is a piece of officially licensed Star Wars merchandise, where it will ensure your drink remains nice and cool, even when your hand is as warm as Tatooine itself, Boasting rubber within that hugs a standard 12 oz. can perfectly, there is also a hole at the bottom that prevents vacuum and allows condensate to drain.